On October 1, 1963, Pontiac’s GTO debuted as an option package for the deluxe Tempest model, the LeMans. The package included a 325-horse 389 V-8, stiffer suspension and a Hurst-shifted three-speed manual transmission. Among popular options was a Muncie four-speed a 348-horse Tri-Power 389 topped by three Rochester two-barrel carbs. 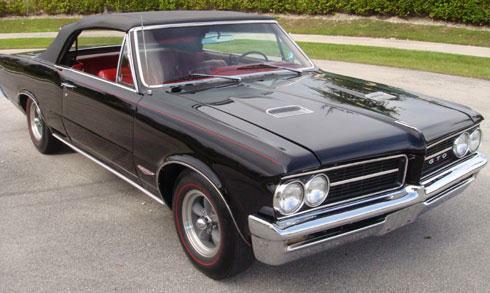 The 1965 GTO was marked by stacked headlights and a single hood scoop in place of the dual units seen in 1964. The 389 V-8 was superseded by an enlarged 400 cubic-inch mill in 1967. Both 1966’s base 389 and 1967’s 400 were rated at 335 horsepower. Tri-Power was last offered in 1966. Performance enhancements included a dealer-offered “tub” introduced in August 1965. It sealed the Tri-Power V8’s carbs to a functional hood scoop, in the process kicking off Pontiac’s legendary “Ram Air” legacy. A special “XS” performance package, including the division’s first so-called Ram Air V-8, appeared in 1966. Output for 1967’s rare Ram Air 400 was 360 horsepower. Click here to read Hemmings Motor News' Buyers Guide for the 1965 Pontiac LeMans GTO..